Students need to isolate and produce beginning, middle and ending sounds in single-syllable words. 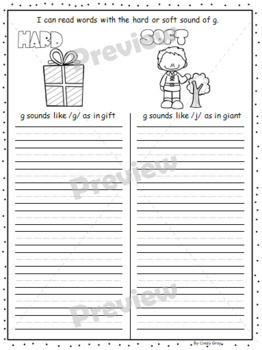 As a step to get our students there, they need to hear the long and soft sounds of G in words and know how they are represented in those words. 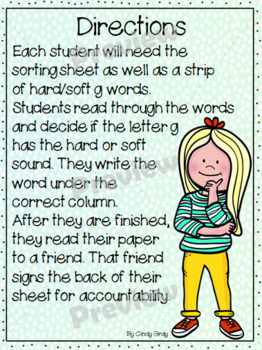 This sorting activity will help students recognize and internalize the hard and soft sounds of g.
Included is one student sorting sheet and THREE separate sheets of hard and soft G words to sort. In total, three days worth of word sorting activities. Click here for Sorting Words with the Hard or Soft Sound of C.